Last year, I took Athena to Alisal Guest Ranch in Solvang, California and she had one of the best days of her life riding a small horse around the corral. She talked about it for months. 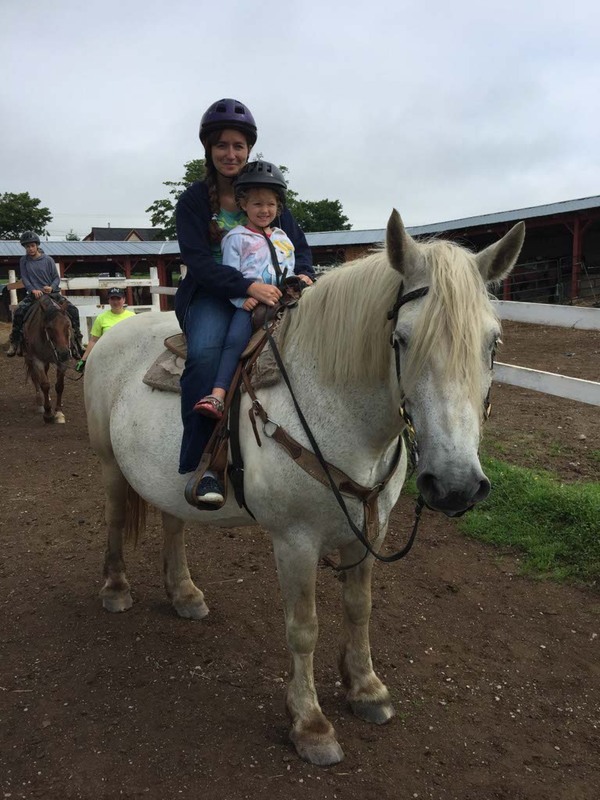 When I heard that Broadleaf Guest Ranch in Riverside-Albert, New Brunswick offers trail rides for children Athena’s age as long as they are accompanied by an adult, it was the first thing I added to my list for this visit. 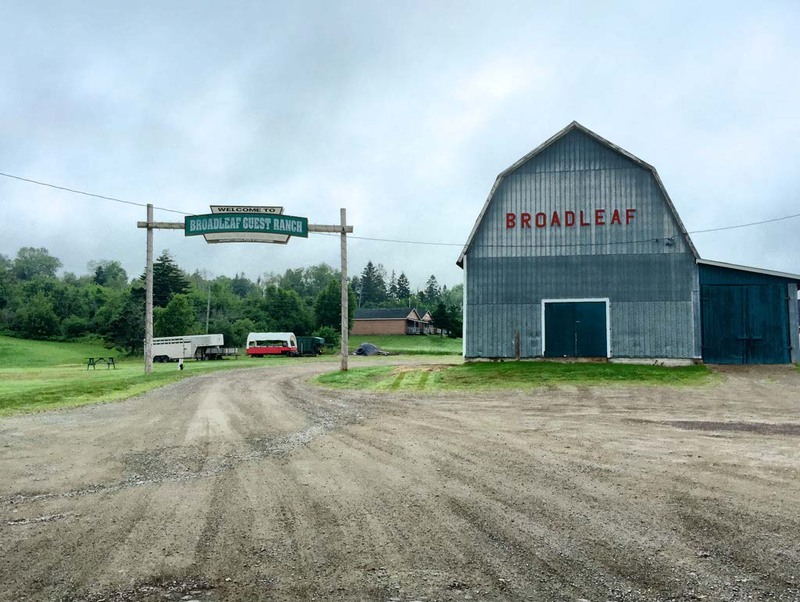 Broadleaf Guest Ranch is an 1100 acre, family owned and operated adventure business located in Albert County, New Brunswick, in the heart of the Bay of Fundy. They have been in business for more than 50 years and 3 generations. Their experience made me feel comfortable about booking with Athena at such a young age. She was even happier with the experience than I anticipated. The smile on her face during the entire ride was magical. We arrived early for our 10:30 appointment so we took the time to walk around the stable and get familiar with the horses. I didn’t want Athena to feel intimidated by their size or nervous from their movements. Arriving early gave us a chance to settle in and relax. 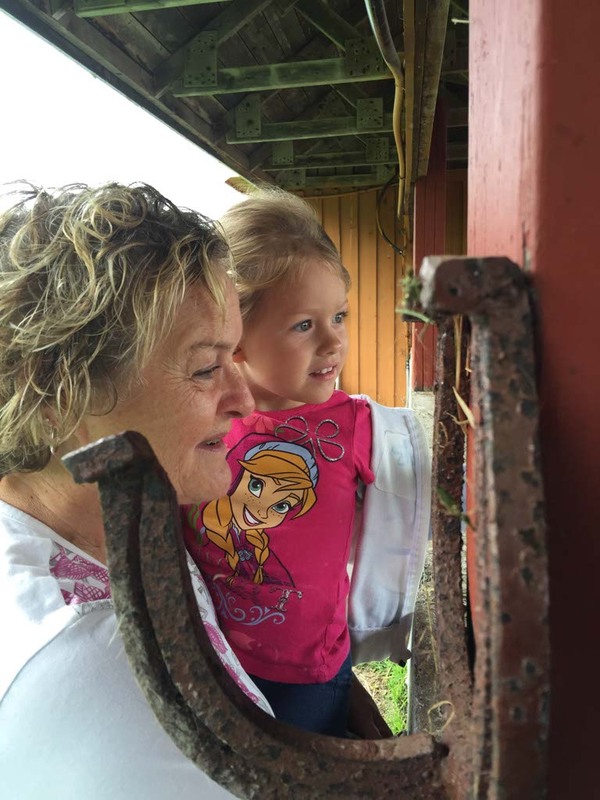 Athena’s nanny, Wendy, joined us and they both looked at the horses with the wonder of a child. Watching Athena calming pet the horse she was about to ride reassured me that it was going to be a good experience. 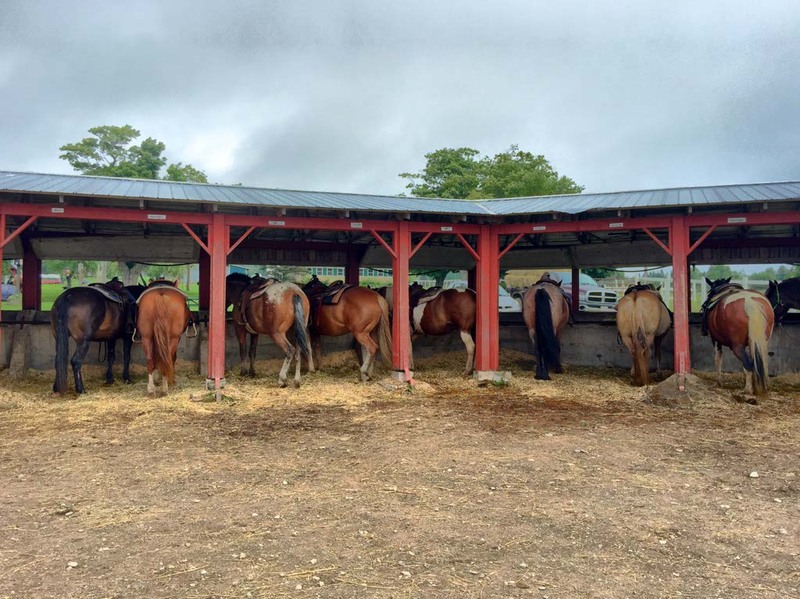 We filled out the paperwork and headed inside the gate to mount our horses. Wendy was riding on her own and Athena was riding with me. There were stairs and a platform to easily get on the horse. Wendy climbed up first and Athena stood close to me and held my hand while we waited. She didn’t look anxious or say that she was nervous but I noticed her reach for my hand for comfort. I just held her hand and said how excited I was to ride a horse with her. I explained how long we’d be on the horse and that we were going together. I also talked to her about how slowly the horse trots and how we sit in the saddle. She usually feels more comfortable with new experiences if I explain as much as possible to her. I give her time to ask questions as well. She asked if the horse would run or if he would lick her while we were riding. All of my answers must have made her happy because she walked up the steps and smiled at the horse before getting on. She smiled from the time she sat on the horse until we left the parking lot and she only stopped because she fell asleep. The horses took us along a grassy trail that last 30 minutes. We rode in the back and a guide led the way. Wendy was directly in front of us and her horse had us laughing the whole ride. He was farting and his name was Freddy so Athena cleverly called him Freddy Farter and she would giggle hysterically every time he did it. When she wasn’t laughing at Freddy Farter, she was singing to her horse and encouraging her by saying, “Good girl, Belle.” Athena’s kindness to both people and animals is one of my proudest accomplishments. When we arrived back at the stable, Athena asked me how soon we could do it again and by the time we got in the car she was saying she missed Bell. It’s difficult to say what activities will interest kids and what adventures will be a flop. I want to expose Athena to as much as humanly possible and let her decide for herself what she likes and dislikes. Her face lights up when she’s around animals so I think we’ll find ourselves back at Broadleaf Guest Ranch before leaving New Brunswick. 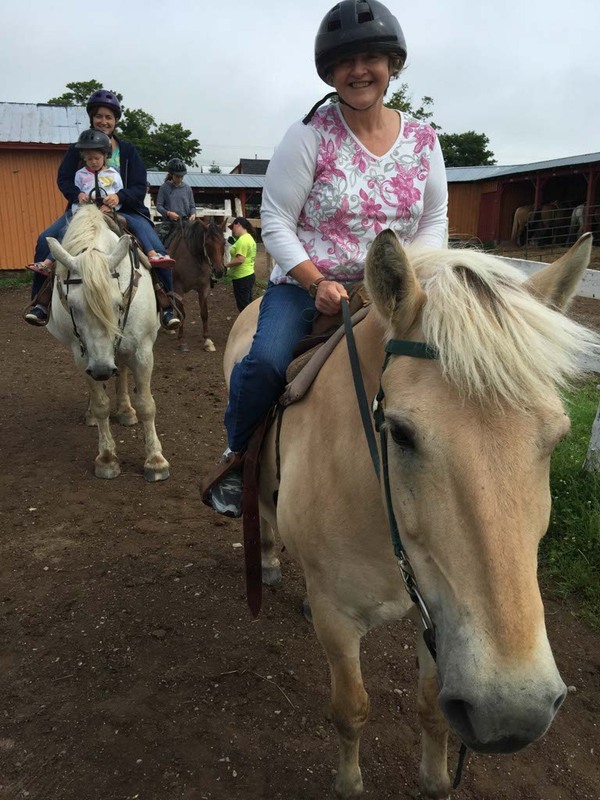 This entry was posted in Canada, New Brunswick, Travel and tagged Broadleaf Guest Ranch, Canada, family travel, Horseback riding, Horses, New Brunswick, travel by lesleycarter. Bookmark the permalink. I grew up with horses and this brought back a lot of memories. When I was in my early teens, I could ride my horse across country 26 miles from East San Diego county to the Mexican border and not see a house, car or person. It was one of my greatest joys to leave in the early dawn when the dew was still on the grasses. It’s wonderful to see Athena so at ease with animals. They are a precursor for being at ease with people. My daughter loves horses, too. We always rise the pony at the petting zoo when we visit. New Brunswick isn’t so far away. I’ll have to make a note in case we are ever vacationing there. What a fun thing to do with her. She sounds like a great kid! 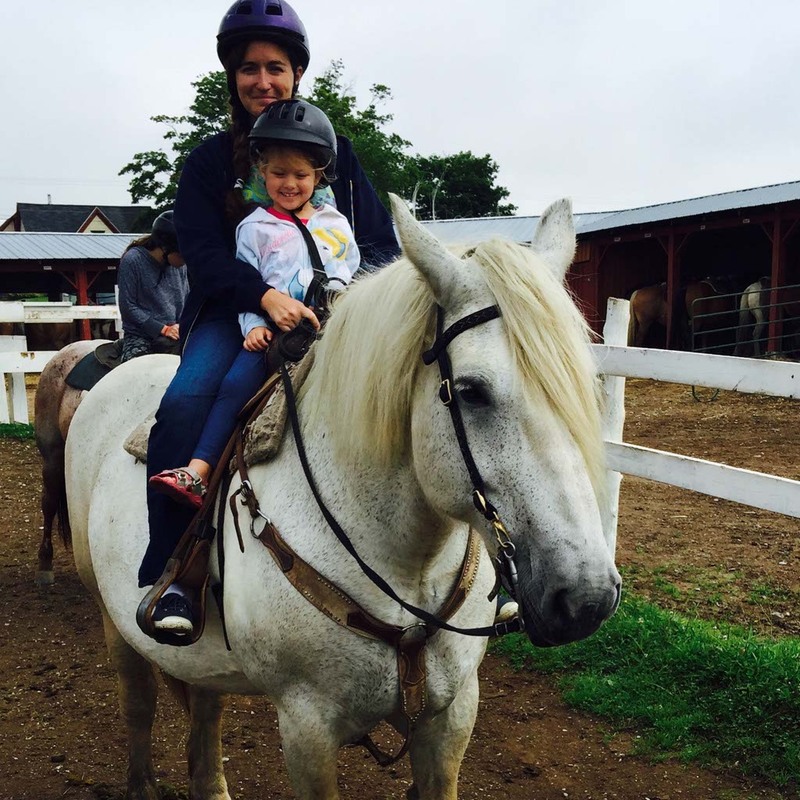 I love horseback riding and Athena seemed to love it too. Great pictures too! So wonderful to see you in our fair Province! Loved the pics! What an amazing opportunity for your little one! Kids need to get out and have more experiences like this! When kids are this small they don’t really remember many details in later years, I’ve found. But it’s a layering process and you’ve given her a loving impression that will last forever. It’s great to expose children to lots of different opportunities. This seems one that your daughter loved. What a great way to spend a day. Love this! Great shots! Your little girl’s smile is precious! What an incredible experience you’ve given her. It’s one that she’ll remember the rest of her life. Great post. I love the photo of Athena and Wendy. I’m sure Freddy the Farter enjoyed having you visit! Awww! How cute is this! This made me smile at just how cute your daughter is. I am glad that she had a great fun experience! I think it’s great that you explained everything to her before doing anything, I think most children will feel better once they understand and to be able to have a choice rather than be scared going to the unknown. Love the story of FREDDY THE FARTER…..Hope you all have a great weekend.